(Nanowerk News) The development of photodetectors has been a matter of considerable interest in the past decades since their applications are essential to many different fields including cameras, medical devices, safety equipment, optical communication devices or even surveying instruments, among others. Many efforts have been focused towards optoelectronic research in trying to create low cost photodetectors with high sensitivity, high quantum efficiency, high gain and fast photoresponse. This is of paramount importance especially in the short wave infrared which currently is addressed by very expensive III-V InGaAs photodetectors. The development of two main classes of photodetectors, photodiodes and phototransistors, have partially been able to accomplish these goals because even though they both have many outstanding properties, none seem to fulfill all of these requirements. While photodiodes are much faster than phototransistors, phototransistors have a higher gain and do not require low noise preamplifiers for their use. To overcome these limitations, ICFO researchers Ivan Nikitskiy, Stijn Goossens, Dominik Kufer, Tania Lasanta, Gabriele Navickaite, led by ICREA professors at ICFO Frank Koppens and Gerasimos Konstantatos, have been able to develop a hybrid photodetector capable of attaining concomitantly better performance features in terms of speed, quantum efficiency and linear dynamic range, operating not only in the visible but also in the near infrared (NIR: 700-1400nm) and SWIR range (1400-3000nm). At the same time this technology is based upon materials that can be monolithically integrated with Si CMOS electronics as well as flexible electronic platforms. The results of this work have been recently published in Nature Communications ("Integrating an electrically active colloidal quantum dot photodiode with a graphene phototransistor"). 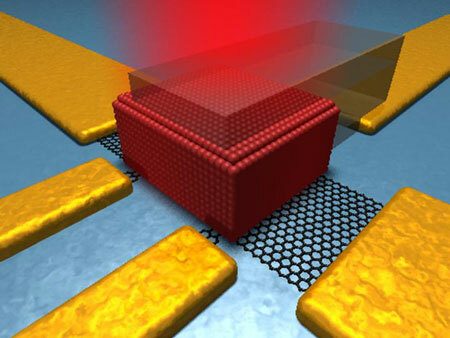 To be able to achieve this, the team of researchers developed a hybrid device by integrating an active colloidal quantum dot photodiode with a graphene phototransistor. By including an "active" quantum dot photodiode, they were able to increase charge collection in a highly absorbing thick QD film, which in turn increased the quantum efficiency as well as the photoresponse. The active quantum dot layer enabled a more effective charge collection by exploiting carrier drift towards the graphene layer instead of relying only on diffusion. The researchers then combined this scheme with a graphene transistor to register ultra-high-gains and record gain-bandwidth products, thanks to Graphene's 2D character and remarkably high carrier mobility. The results obtained in this study have shown that this hybrid architecture does clearly demonstrate the potential of graphene and active quantum dot materials, opening new pathways for their integration in other optoelectronic materials in search for much higher performance and a broader spectrum of functionalities.